I once had a pair of ankle boots called ”Jollys”. In fact they where the only shoes that I have ever worn out. I went right through the soles in four years traipsing the streets of Budapest. So ”jollies” seems to me a very appropriate name for nice things to do on one’s days off. A name for a conductor’s "bits-in-between". Today is the day in 2008 that I flew back to Germany after being in the UK for five weeks and when I began the move into my lovely flat. My new flat with all its nice places to sit in is itself a jolly. 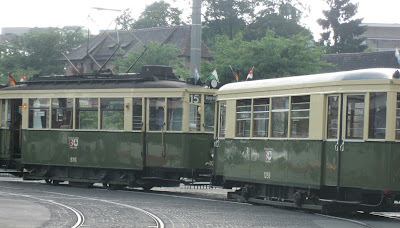 Today’s treat or jolly has been marked off on the calendar for months, ever since I noticed it mentioned in the Nürnberg Transport Magazine VAGmobil while I was riding the trams. 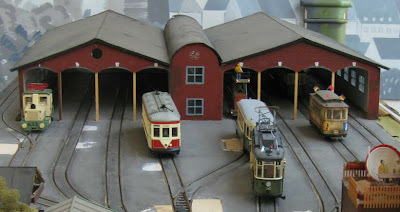 Not only were old trams to be running from the depot through the city but there was also an exhibition of model tram layouts. Since I have just set up my own N-gauge model railway on the coffee table, and built the station to go with it, today’s trip to St Peter was a must. Not only were there old trams to ride on and model trams to drool over, there were a few old buses and a lovely café, in a tram of course. There were also lots of lovely treats to purchase, for example cut-out cardboard models and postcards at my end of the price scale and at the other end the very expensive brass models of the old-timers. 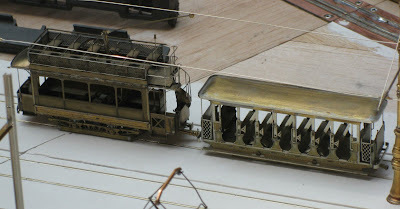 Even the cardboard models running on layouts with a motor looked very authentic. I have my railway what more could I want? Well, maybe something on the balcony, one day! I had left home in the direction of the railway station in the middle of a thunderstorm but by the time I was on the 1930s Historic Tram that was to take me to St. Peter’s the storm had moved on to disturb someone else’s Saturday and I was sitting in sunshine. The conductor sold the tickets and told us a few interesting facts before we reached our destination. Here I spent an hour browsing the exhibition before boarding the old-timer bus for a trip around the city, discovering the sites of the toy manufacturers of Nürnberg, of which there are a great many. Most of these are now long gone, many of them having disappeared over the last few years. The sign on the Fleischmann offices disappeared from its head-quarters at the end of my street only a few weeks ago. The annual Toy Fair is still a huge affair in Nürnberg, though, and attracts people from all over the world, the names of Issmayer, Fleischmann, Heß, Hamo, Distler, Bing, Bub, Biller, Arnold, Trix and Lehmann, among others, put this city on the toy-manufacturing map. The first children's rattles were built in Zirndorf in 1840 and in 1913 the company Lorenz Bolz brought the first humming tops on to the market. The company Bing was the biggest toy manufacturer in the world at the time. 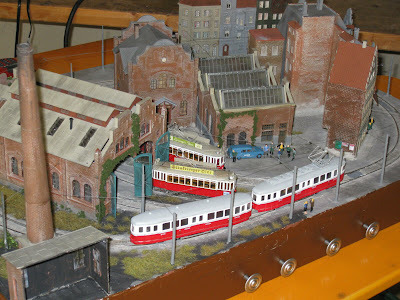 Around 1910 there were 8000 people working in tinplate toy manufacturing in Nürnberg, in 100 different companies. Today, the big names of Trix, Lehmann and Fleischmann have all closed their doors in 2009. 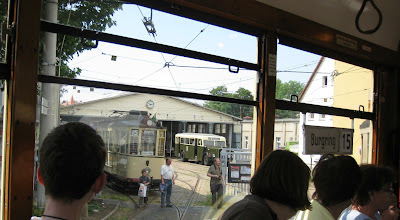 I returned to the tram depot just in time to catch the last historic tram of the day home. It was a jolly day had by all, but especially by the man who had travelled by ICE all the way from Hamburg for this treat. How lucky I am having it all on the doorstep! 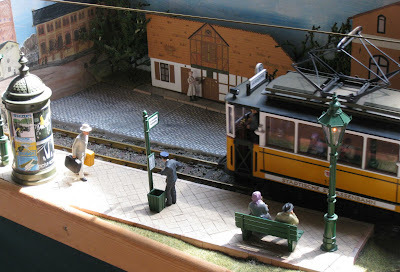 In the winter I saw the Historic Cinema Tram passing by the end of my street. I believe that it is time to make enquiries about what film is showing next.